If you tuned in last Friday, you know that we ventured to Dallas for the day. We have had that date on the calendar for so long…since June 2 actually! 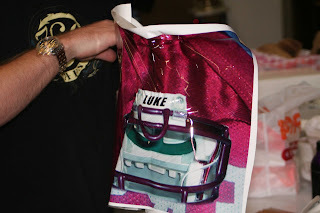 The day we got home from the plagio clinic and found out Luke was a helmet candidate, I started doing my research on decorating it. Hey, I figured if you have to wear it 23 hours a day, you might as well do it in style. I wore a back brace 23 hours a day for 5 1/2 years for my scoliosis – I know how much it stinks to have people stare and make fun of you. So, I was all about making this fun for us and for Luke. Fortunately, we were led to 360wraps, a company in Dallas, by a college friend of ours, Tommy Tanner. His son, Will, wore a helmet and sported the first-ever Aggie design. It was awesome!! 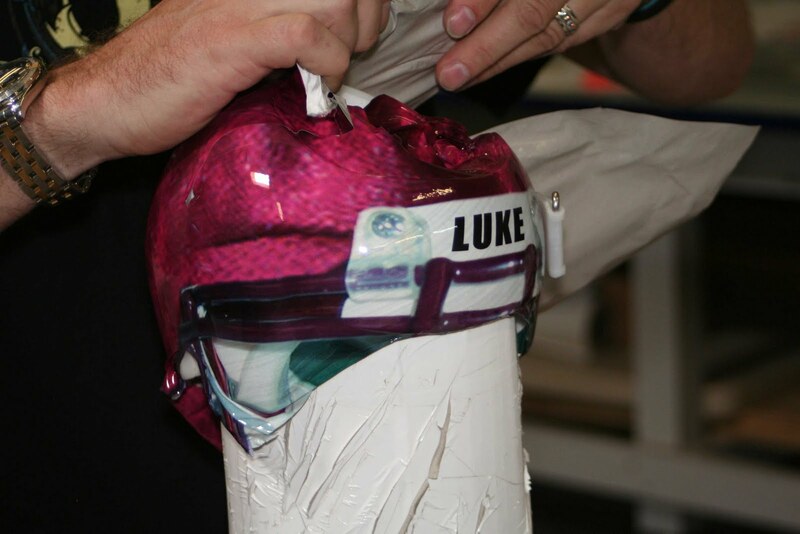 We went online and requested a time for them to wrap Luke’s helment. We were thrilled to get an email about a week later saying that we were all set for July 16. And the best part? It was 100% free. We arrived a little early so they could measure Luke’s helmet and get his wrap designed and printed. Usually, parents go in three days before and do this, but they were nice enough to let us out-of-towners come just before the party. To be perfectly honest, we had no idea what to expect. 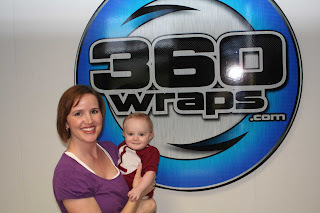 And, even though I had read the “about us” section at wrapbuddies.com, the non-profit associated with 360wraps, I didn’t fully appreciate the generosity of Tommy and his co-workers at 360 until we arrived. 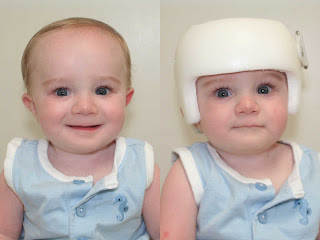 One by one, parents entered the rooms with their cute babies with slightly mishapen heads. 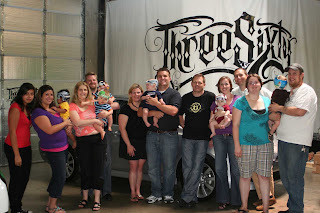 There was a set of twins, two Dallas Cowboy fans, us and a nearly walking 11-month-old – all boys! Everybody’s stories were a little different. 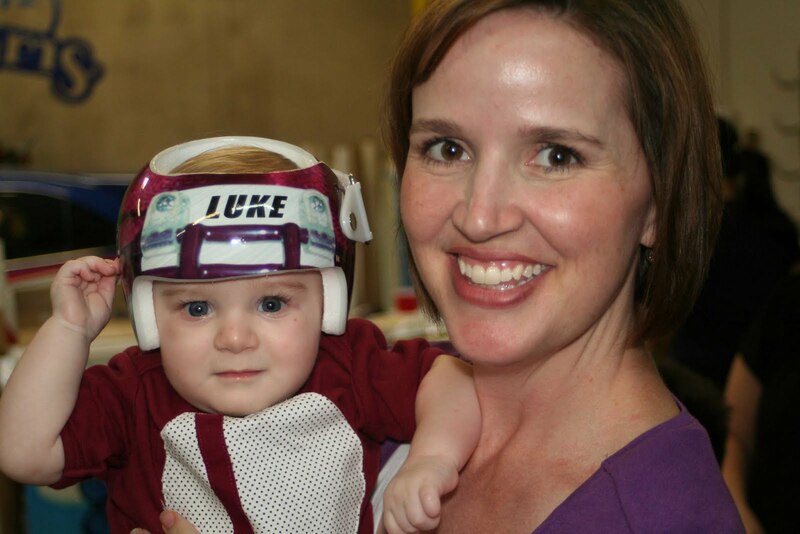 It was incredibly reasurring and non-stressful to be in a room with people who had the same headgear as our son. No one stared at us funny or asked completely inappropriate questions. Around noon, the party started, we enjoyed a little potluck food, chatted with the other parents and met the owner, Tommy Strader. 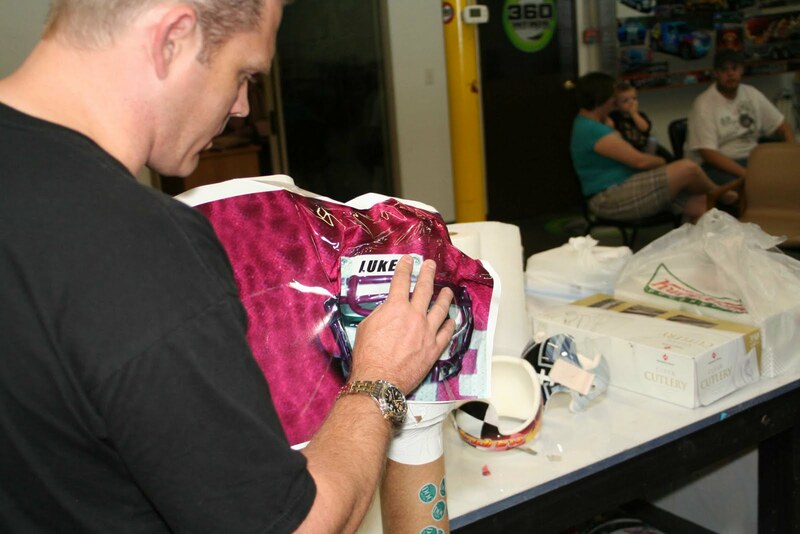 He carefully applied those big stickers, crafting and adjusting it just *so*. That’s a mighty fine looking Aggie helmet if you ask me. 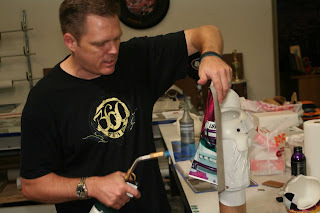 As Tommy started wrapping the first helmet, he began to tell us the story of how wrapbuddies was born. It was his witness and his easy-going candor that left the room speechless, sprinkled with some laughter. The short story of his philanthropy goes something like this. Dad offers to pay. Tommy says no. Dad offers again. Tommy tells him his motorcycle helmets run $800-$1,200. Dad takes him up on the “free” offer. Happy Dad and son leave. Then the calls and visits start coming. Word gets out. He starts wrapping so much, he can’t get his work done. Implements a system. Instead of just wrapping four helmets in 12 hours he manages to get a system working and can do 15 helmets once a month in just 4 hours. Wrapbuddies.com is born. He writes an article in his trade journal, encouraging other shops around the country to follow suit. So far, 10 have taken on the task with inquiries every week about how to get it started. His only request? They have to be free. I’d like to say the story ends there…but his outreach goes further. A kid with a prosthetic leg calls. Then a girl with a back brace. And that’s when I started to cry. I could feel those tears burning my eyes as he told us her story. She hated being made fun of…she wanted to be the envy of the school. Would he help her? Absolutely. I so wanted to go hug that man and tell him that what he’s doing is changing kids’ lives. And for these babies, it’s changing parents’ lives. Some may say it’s just a decoration. But when you’re the one wearing the orthosis, when it’s you people stare at, well…it’s life-changing. You go from being “that” kid to “that really cool kid with the awesome design”. Now he has plans to wrap walls and floors at Shriner’s Hospital. 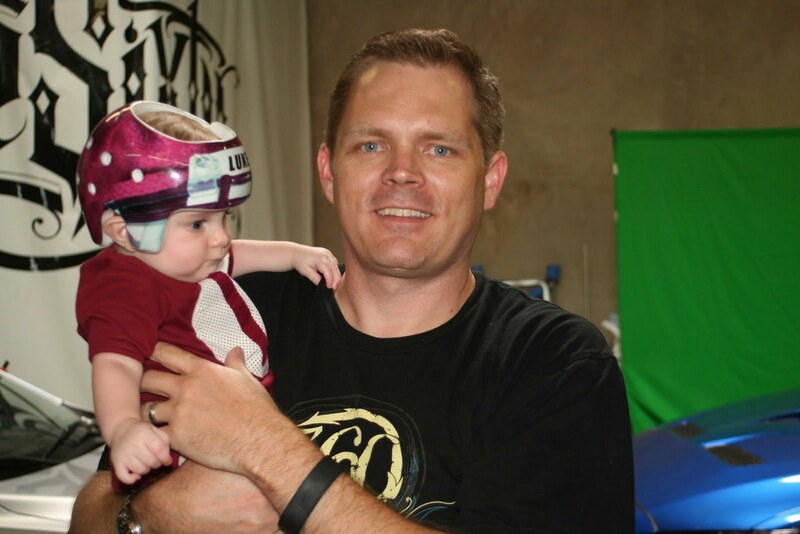 He wants to wrap the world – all in the name of kids! We took group pictures, exchanged emails, shook some hands and said a prayer of thanksgiving for a man who, as Scott says, is one of the most philanthropic-minded individuals he’s ever met. And, that, my friends…is a wrap! What a GREAT story, Kathryn! 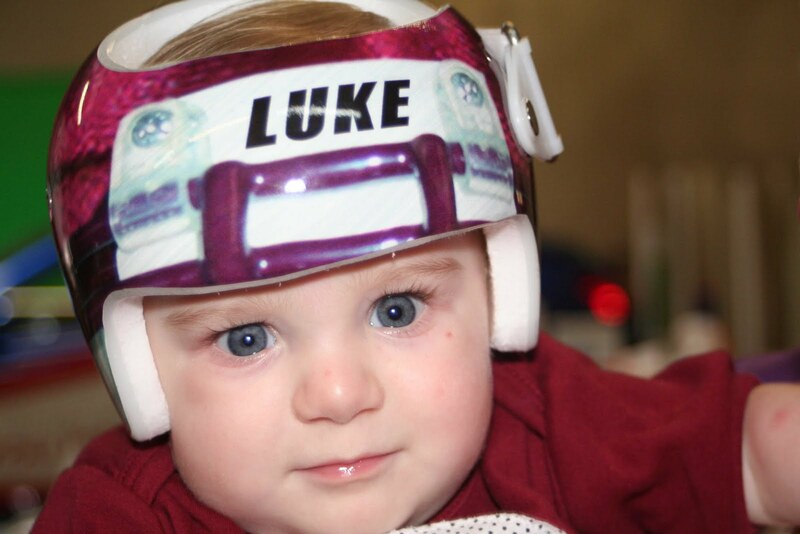 …and Luke looks mighty cool in his helmet! I love it!!!! I love you guys!!! I miss you lil Luke. Big Luke says HI from the Buckeye state! The Spidey looks mighty "TUFF". Just like his God Mom- tough on the outside— sweet on the inside! LOL!! Another great adventure with Luke! He sure has introduced you (and us) to many things we never even thought about. He is a really adorable Aggie-in-training!! Man, that Luke is cute. I should no better than to read your blog without tissues handy! Thank you for sharing such an inspirational story.